A newly released report by ForestEthics says that the junk mail in USA alone contributes to global warming as much as seven US states combined, or more than nine million cars, or the emissions generated by heating nearly 13 million homes for the winter. Along with the junk mail report the ForestEthics group stressed the importance of their campaign and petition for a Do Not Mail Registry "to give Americans the choice to stop receiving junk mail." "This report confirms what Americans instinctively know: the scale of junk mail's waste goes against all common sense," says Todd Paglia, Executive Director of ForestEthics. "And the junk mail industry is incapable of policing itself on this matterâ€“ we need a Do Not Mail registry to give Americans a choice, and to enforce that choice." The Do Not Mail campaign was launched on March 12 of this year and already now has nearly 60000 signatures. The list contains well-known names such as those of Leonardo DiCaprio, Adrian Grenier, David Crosby and Daryl Hannah. 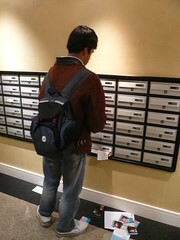 Another and more direct way to reduce junk mail can be by using a service like ProQuo.com. ProQuo is a free, easy-to-use Web site that allows consumers to remove themselves from the most commonly used marketing lists in a matter of minutes.